Kemp P. Battle (Kemp Plummer), 1831-1919 An Address on the History of the Buildings of the University of North Carolina, by Kemp P. Battle, LL. D, President of the University, Delivered on University Day, 1883, in Gerrard Hall. 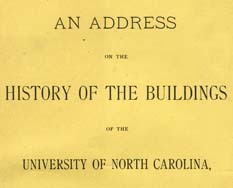 An Address on the History of the Buildings of the University of North Carolina, by Kemp P. Battle, LL. D, President of the University, Delivered on University Day, 1883, in Gerrard Hall. Greensboro, NC: Thomas, Reece & Co., Printers, 1883. Chapel Hill (N.C.) -- Buildings, structures, etc. Chapel Hill (N.C.) -- History. University of North Carolina (1793-1962) -- Anniversaries, etc. University of North Carolina (1793-1962) -- Buildings.